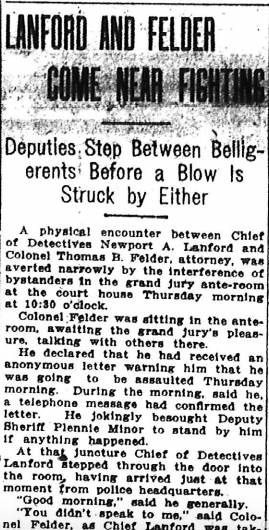 A physical encounter between Chief of Detectives Newport A. Lanford and Colonel Thomas B. Felder, attorney, was averted narrowly by the interference of bystanders in the grand jury ante-room at the court house Thursday morning at 10:30 o’clock. Colonel Felder was sitting in the ante-room, awaiting the grand jury’s pleasure, taking with others there. He declared that he had received an anonymous letter warning him that he was going to be assaulted Thursday morning. During the morning, said he, a telephone message had confirmed the letter. He jokingly besought Deputy Sheriff Plennie Minor to stand by him if anything happened. At that juncture Chief of Detectives Lanford stepped through the door into the room, having arrived just at that moment from police headquarters. “Good morning,” said he generally. “You didn’t speak to me,” said Colonel Felder, as Chief Lanford was taking a chair. “Walk over here and I’ll speak to you,” said Lanford. “You come to me. I’m sitting down,” said Mr. Felder. The bystanders bundled Colonel Felder out of the room and locked the door, with Chief Lanford and others remaining inside. A few moments later, twenty minutes after the grand jury convened shortly before 11 o’clock, Chief Lanford was called into the grand jury room, being the first witness of the morning’s session. He passed Colonel Felder as he went toward the jury door. Both glared. Neither spoke.